A classic design adapted for sports, pull on for your next training session or for everyday wear the Nike 3 Pair Pack Cotton Crew Socks in Black. 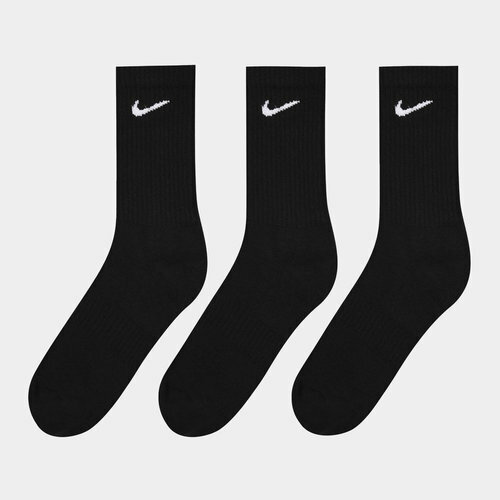 This three pack of ankle height socks from Nike have a plain and simple design and feature ribbed cuffs, reinforced heel and toes and arc compression for a secure and comfortable fit as well as durability. Made from cotton, polyester, nylon and elastane material, these socks feature Dri-Fit technology to help keep the wearer feeling drier and more refreshed by wicking sweat away from the skin and quickly drying off. For the gym, running and a variety of sports as well as for general casual wear, keep your feet feeling refreshed no matter what the situation with the essential Nike Cotton Cushion Crew Socks.